Mice Removal Experts Suffolk County | EcoTech Pest Control Inc.
COLOR: VARIES. USUALLY GRAY OR BROWN. There are several species of MICE native to Long Island, but they are all about the same size and have similar characteristics. The three most common types of MICE are the white-footed, the house and the field mouse. They will seek to overwinter indoors, and once they find adequate shelter they will establish a permanent nesting place. Mice urinate and defecate constantly throughout the day. Due to the fact that they have very poor eyesight, MICE will usually scurry along walls and baseboards, urinating and defecating as they go to lay down a scent trail for them to follow between food sources and their nesting areas. MICE will feed on pretty much any type of food source that they find. MICE have been known to carry diseases, which they spread through their feces and urine, as well as transporting bacteria across surfaces they walk on that they collect from the filth that they live in and crawl through. They are also notorious for transporting fleas, ticks, mites and even a species of BEDBUG. Once MICE find adequate nesting places, they reproduce constantly, and can infest a home within a couple of months. One pair of mice, in ideal living conditions, can result in over a hundred mice in just a 6 month period. MICE are excellent at adapting, hiding and surviving. They can often be in your home for months before you are ever aware. By that time there could be a substantial infestation. If you have only seen ONE mouse, it is a good idea to assume that there may be a number of mice hiding somewhere in the premises. 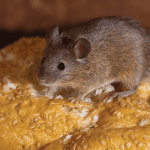 Using glueboards, glue traps, sticky pads, or snap traps is primarily a method for monitoring mice, and not really an effective means of ridding your house of MICE. If you’ve seen a mouse in your home, you should call in a professional before the problem escalates into something severe. A TRAINED ECOTECH TECHNICIAN CAN RID YOUR HOME OF RODENTS QUICKLY AND EFFECTIVELY WITHOUT EXPOSING YOU OR YOUR LOVED ONES TO HARMFUL CHEMICALS.